All over America families will be honoring "Father" this weekend. If your earthly father is still alive, you will probably be doing something special for him. If he is no longer on this earth, you will be thinking about him anyway and doing a little reminiscing―or perhaps a lot of reminiscing. As we are honoring fathers on Sunday let us not forget to honor the Heavenly Father. Without Him, there would be no fathers. There would be no "us". Wow, that is just mind boggling. I know that not everyone who visits Spiritual Sundays and who shares with us lives in America. Some of your holidays are different from ours. Even if you live in a country that does not celebrate Father's Day this week, you will still want to honor him. Seems like every week there are serious concerns that we need to be praying about. I hope you will remember to go to the Prayer Request page and pray for those listed. If you know of some of the concerns there no longer need to be on the list for one reason or another I would appreciate it if you would let me know, and I will make the correction. If you have something or someone you want to add to it, let me know. God is the father of all fathers, like you write, Charlotte - filled with both unconditional love, encouragement, justice and patience... To start with! And happy belated 5th anniversary of the Spiritual Sundays! Thank you Charlotte for faithfully hosting every week-- I've been AWOL for several weeks (that pesky teaching job just overloads at the end lol!) But hopefully I'm getting back in the swing now. Hi! Hope your summer is going great. Have a blessed month! I hope your hubby is having an awesome Father's Day. I am so thankful that my dad is alive and well at 84 years of age. Although not a perfect man, I never doubted his love for me. The older I get, the more I realize how rare this actually is. Thank you for hosting Charlotte. My dad has been in heaven for many years. Cigarettes cut his life short, but I honor his memory and the good times we shared. He taught me to drive a car, and laid down the rule, no dates until you are 16, except to go in groups. Groups were more fun anyway. 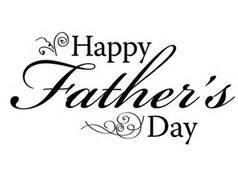 Happy father's day to you all. My hubby received a couple cards, and a phone call, and tomorrow a lunch from our daughter and son in law.